After she experienced pain resulting from hip alignment problems, this runner explains why proper alignment is so important in running. I was in severe pain. The kind of pain that makes a runner question their injury-free status, as well as their pity party about miserable running weather. It could be hailing, for all I cared–I just wanted to feel good enough to run again. I’m quite naïve when it comes to the medical world, so I did what most naïve runners do: I Googled my symptoms. Ten minutes later, I was on the verge of tears, convinced I had a sacral stress fracture. All the symptoms were there. I was doomed. Because I was a collegiate student athlete at the time, I had excellent resources. Thankfully, I had enough sense to make an appointment with my team’s athletic trainer. We both knew I had a history of stress fractures. I was familiar with the pain. “It feels just like a stress fracture,” I told her. Luckily, it wasn’t. Instead, my hips were apparently rotated. This was wreaking havoc on my running stride and putting undue stress on my muscles. A few adjustments and a rehab regimen were all I needed to get back on the trails. I was relieved, but also confused. 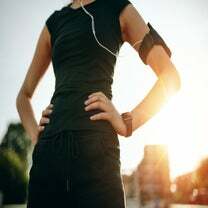 Truthfully, I was embarrassed to admit that, although I’d been a collegiate runner for two years, I had no clue that the alignment of my hips was so impactful to my running. Clearly I’d been missing something. So, I did some research. Given my lack of medical knowledge, I’ll explain this to you in the simplest of terms: As a runner, your power comes from your hips. They propel your body into motion by driving your legs. But they can get out of alignment due to a variety of factors, like your posture, pre-existing injuries or your running mechanisms. When they do get out of alignment, it can cause pain—nasty pain, like the kind I was feeling. The misalignment can even cause bone injuries (like stress fractures) if it’s not properly addressed. Once I knew how important my hips were to my running, I got my hip alignment checked regularly. But that wasn’t all I did. I learned that strengthening exercises, along with regular hip alignment, could help my hips stay in alignment better, so I started doing some. I wasn’t entirely sure how the hip checks and exercises would improve my alignment, but if it nixed the back pain, I was all for it. Maybe you are clueless about the mysteries of your body’s mechanisms. That’s okay; I was, too. But if you’re a regular, competitive runner with back or hip pain, I would encourage you to get it checked by a physical therapist or sports chiropractor. At the very least, you can add hip strengthening exercises to your pre-run routine. Trust me: Five or 10 minutes of prehab is worth it. If you keep your hips healthy, you’ll go far. If not, you might have to face larger injuries down the road.